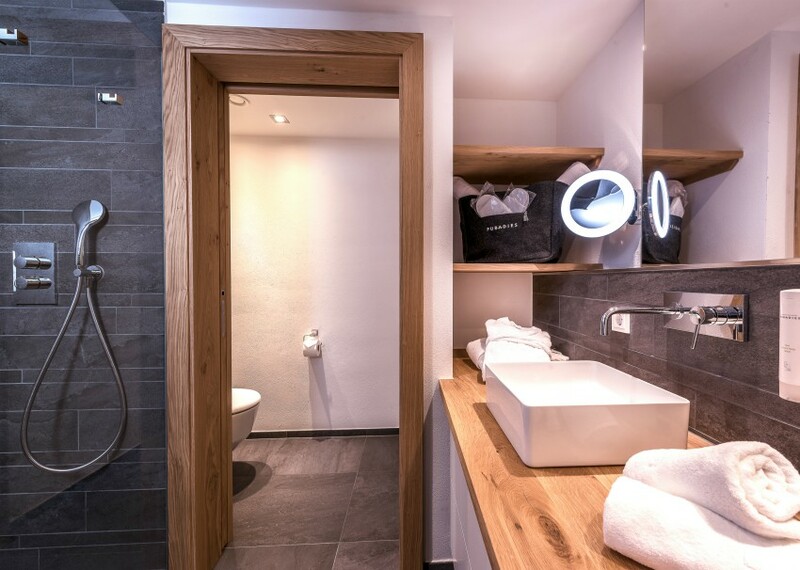 Located in the village resort of Leogang which is lift connected with the Saalbach-Hinterglemm-Fieberbrunn Ski Circus, the 4* Superior Hotel Puradies is a contemporary Alpine-styled Hotel with a large Wellness area and features one of the most iconic, stylish Hotel bars in the Alps. The Steinbergbahn Gondola is just 150 metres from the Hotel and, snow permitting, it is possible to ski to and from the Hotel. Short breaks welcome. 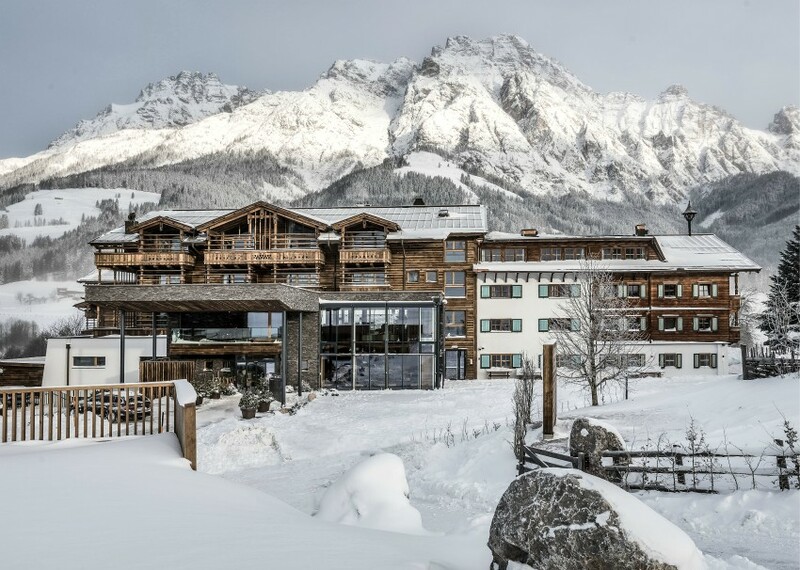 Under the gaze of the majestic Leoganger Steinberger Mountains, the Hotel has a reception and lobby area, luggage storage, lifts, large library with panoramic views, TV room, ski and boot room, breakfast room and 5 restaurants. Lift passes can be purchased at reception and Ski School can be organised via the Hotel too. Free WiFi throughout. 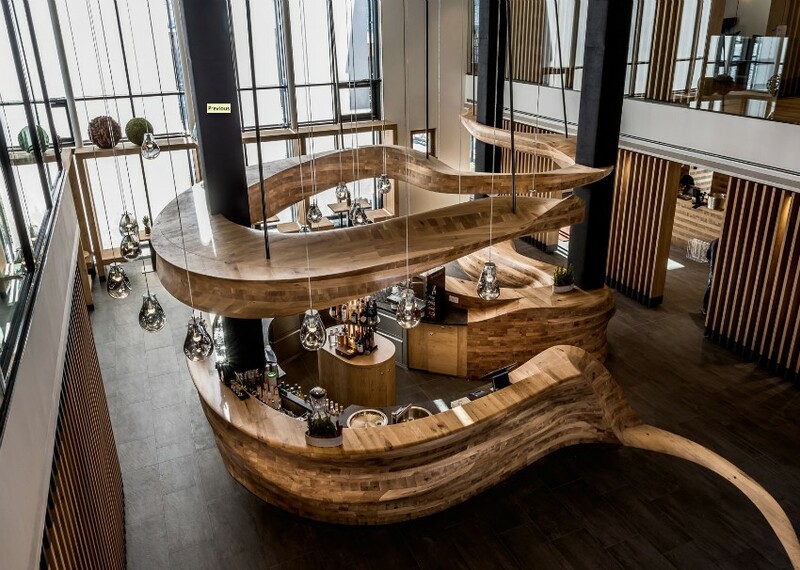 One of the highlights is the ‘Freiraum’ Bar, a continuous 42-metre long wood sculpture crafted from 16,000 individual oak blocks which form the bar itself and sitting areas around the lounge. Design furniture. The Hotel also offers an extensive Wine Cellar and seminar and meeting rooms. 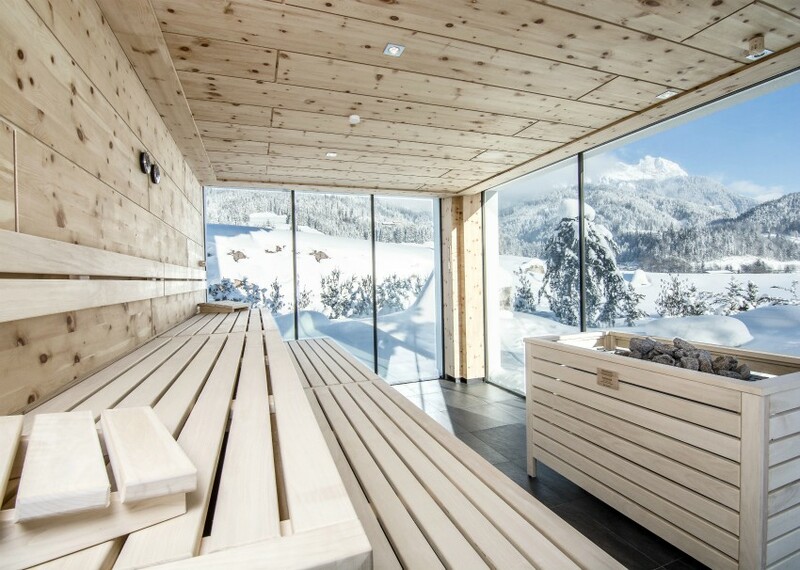 Wellness facilities are over 800 m2 spread over two floors with a number of different Saunas, steam room, experience showers and relaxation areas with panoramic views of the Alps. Beauty treatments and massages can also be booked locally and there is a large Children’s play area. All rooms are en-suite with hairdryer, telephone, cable-TV, free WiFi, safe, bathrobes and slippers. 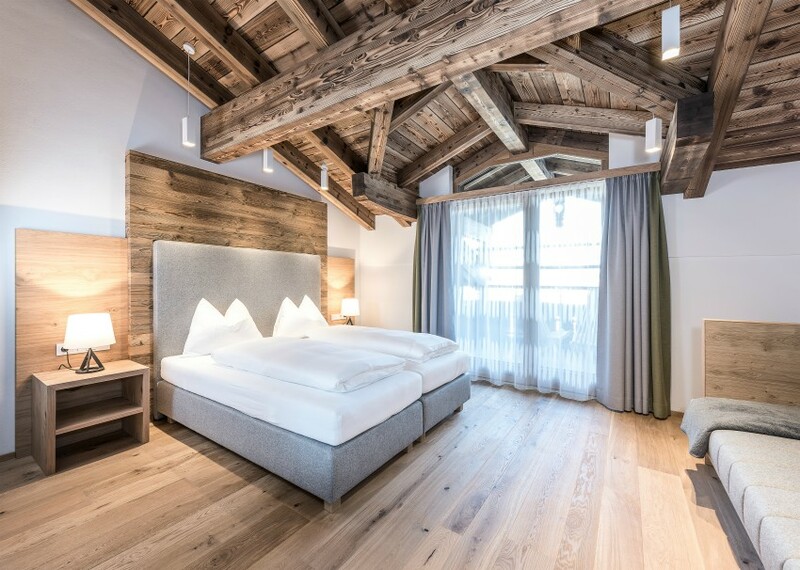 We offer standard double / Austrian Twin rooms (“Geniesser / Connoisseur”, 25 m2, bottom image) and superior 2-3 bedded Deluxe Suites (35 m2, top image) which are finished in a contemporary Alpine style with minibar and balcony. Accommodation is on a half board basis with an extensive hot and cold breakfast buffet with local and organic products. 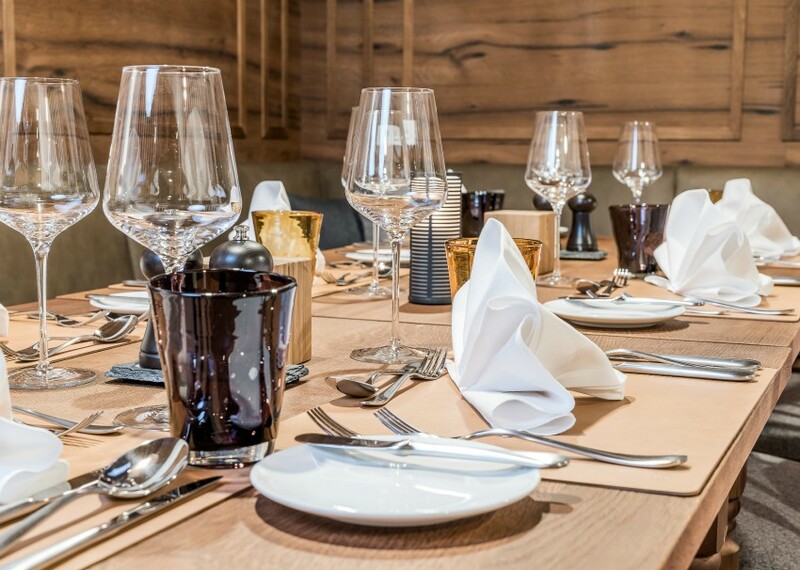 An après-ski snack and fresh, homemade cakes are served from 2-5 pm and Dinner is 5-courses with a choice of dishes taken in one of the Hotel’s five Restaurants. 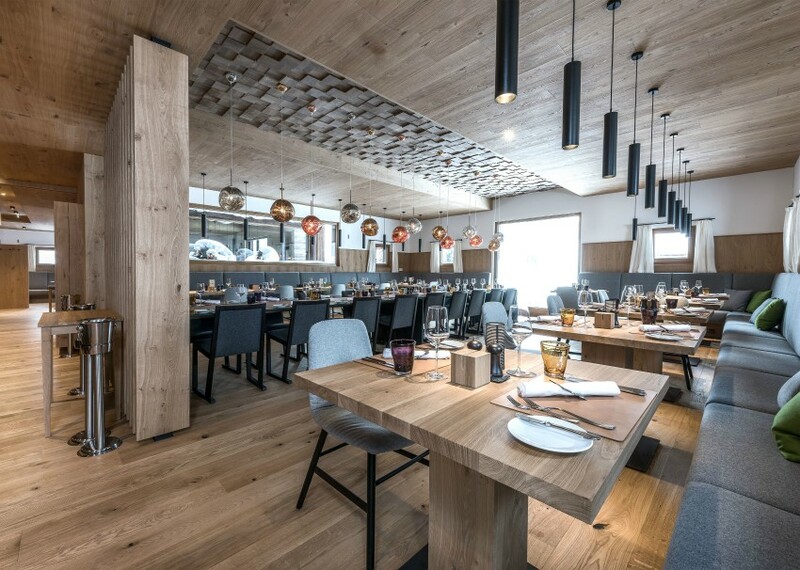 The Puradies enjoys a peaceful location just 150 metres from the Steinberg Gondola which connects with the 270 kilometres of piste on offer in the vast Ski Circus Saalbach-Hinterglemm-Leogang-Fieberbrunn. The Hotel Bar is a work of Art and, without doubt, one of the highlights of the Hotel. Perfect for couples, families and those looking for a more Hotel-based Ski Holiday or short break.